Like so many others before, Matchday 38 ended in familiar fashion. The Big-3 of Spain trouncing the opposition with a combined aggregate of 7-0. Only this time, the results meant a whole lot more. 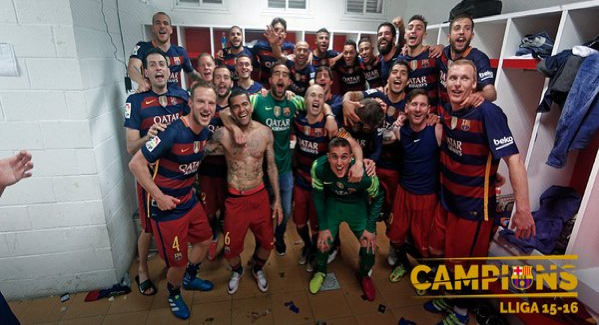 Barcelona are champions of Spain once again, their 24th title overall. For the sixth time in eight years, the Liga trophy will make its way to the cava soaked party in Plaza Catalunya. Luis Suarez again netted a hat-trick, his 6th of the season, more than any other player in Europe’s Top-5 leagues. He finishes the league year with 40 goals, the most scored ever in La Liga by a man not named Messi or Ronaldo. In retrospect, it seemed so easy, but the end of this season was a different story. A victory would guarantee Barcelona a title that most had thought was already secure six weeks ago. But, with the slightest slip, a Real Madrid team many had left for dead after the first month of the season, would win the title. Barcelona’s response was emphatic, especially from Suárez. Barcelona closed the year winning five in a row, with an aggregate score of 24-0, keeping them in a position they know all too well. This wasn’t always the case, and Gerard Piqué knows it. In a year that saw Barcelona legend Johan Cruyff tragically pass away, it was his influence on the club that was still being felt to this day. Prior to his arrival as manager in 1988, Barcelona and La Liga champions were hardly synonymous. They were title winners a grand total of two times between 1960 and 1991, but since Cruyff first arrived, Barca have won 14 league crowns. With him the mentality changed, no longer hoping for the best and praying for the worst. And so it was fitting that Andres Iniesta set the record (29) for most titles ever won by a Spanish player, besting the record of his former teammate Xavi, two men so instrumental in spearheading this golden generation. Still, the star of the show, not only Saturday, but this entire season, was Luis Suarez. The Uruguayan scored 56 times across all competitions, with a chance to further that tally with the Copa del Rey still to play next Sunday. He will finish with the Golden Boot (Europe’s top scorer) and the Pichichi (Spain’s top Scorer), becoming the first player since 08-09 to win that award not named Messi or Ronaldo. If that wasn’t impressive enough, he also led the entire league in assists, displaying a passing game most didn’t know he possessed. More than stats alone, Suarez was the player that pushed them through thick and thin. When Barcelona was stumbling through April, and Real Madrid and Atletico were breathing down their neck, it was Suarez who went to another level. His aggression and win-at-(almost)-all-costs attitude was imperative to a side seemingly low on confidence. A tricky fixture away at Depor saw Barca win 8-0 behind his four goals, while the final four games saw him net another 10, for a final tally of 14 in the last five matches. A truly remarkable feat, and something that once sounded blasphemous had become reality. Luis Suarez was/is Barcelona’s best player, for a season at least. A title remains for Barcelona, if they can win in the Copa final on Sunday. A haul of European Supercup, Club World Cup, Spanish Primera champions and Copa del Rey kings would be impressive. But a reality of this group is that they'll always believe they should have won the double treble by retaining their UEFA Champions League crown. Real Madrid’s season, meanwhile, was a tale of two halves. Seemingly stuck in mud under Rafa Benitez, Zinedine Zidane resurrected a club desperate for a savior. Benitez is a talented coach and a hard worker, but Madrid was always wrong for him, not only vice-versa. Perhaps if that appointment hadn't been forced upon a squad that wanted Carlo Ancelotti to be retained from the start, then Los Blancos might have been champions. Having missed out on the title by a single point is surely a tough pill to swallow. It underlines that several instances of dropped points -- drawing 0-0 with Sporting Gijon or Malaga, losing after having led at Sevilla, drawing after having led at Atletico -- could have, and should have, been wins that would have given Madrid the title by a point. The silver lining comes in the progress that was made. Under Zidane, Madrid amassed a record of 21-3-2. 53 of those points came across league games, a record for a Real Madrid manager across his first 20 matches. Coming so close to the title despite being 12 points behind earlier in the year is something to be proud of. Madrid's great gain from this season is also the knowledge that, while Zidane still has much to prove in terms of strategy and tactics, this being so early in his senior management career, his stature still carries a huge impact on his players. Also, Zidane has put his club in a position to salvage something from the wreckage in a fortnight's time, when it plays in the Champions League Final at the San Siro. The Frenchmen is his own man, something made apparent from the very beginning when he inserted the more defensive minded Casemiro into the starting XI, over the more flashy choices of Isco and James. The move paid dividends as Madrid glided through a relatively easy draw in the knockout rounds of the UCL, while also winning their final 12 league games. A lot of what to expect next season will depend on the result of that final. Back-to-back trophy-less campaigns is something that will never be tolerated under Florentino Perez, with seemingly anyone at risk if achieved, including the three-crowned jewel known as the BBC (Bale, Benzema, Cristiano). If retained, keeping all three healthy will be atop of the wish list come next term. Gareth Bale, prolific in the last quarter of the season, started only 21 league matches. Benzema, just as Benitez demanded, has produced the best league scoring form of his life, but he started just 26 times in La Liga. All in all, a league season once drowning in the inevitable became one of can’t-look-away drama. As fans, we couldn’t have asked for much more, and now the wait begins. Only three months until another league year kicks-off, with a Euro Cup to be played in between. The perfect amount of time for me to formulate another correct prediction.